DINE inns offer ideal training facilities for gold medal winners in the DINE Olympics. It’s been so much fun and inspiring to watch the world’s champions compete in the Olympics at Pyeongchang. We couldn’t help but think that we have world-class guests too, and what if we could launch our own Olympic games in DINE country? The Distinctive Inns of New England (DINE) Olympics has a nice ring, don’t you think? We might have to call it the DINE-O. Either way, we know that we have our own distinctive Olympic games at our 12 DINE inns, and our guests all deserve gold, silver and bronze medals for how well they perform in these very demanding sports. Many of our guests have worked for years and years perfecting their individual prowess to make it into the DINE Olympics during romantic getaways to our inns. Without further ado, let us introduce the world to our own world of adventure and Olympic-level athletic sports at the 12 DINE inns. This blog will focus on sports offered in the more Northern New England DINE inns. Stay tuned for part II next week to learn more about the DINE Olympics at our more Southern New England inns. Starting in Vermont, you’ll find two competitions that challenge the mind and body! 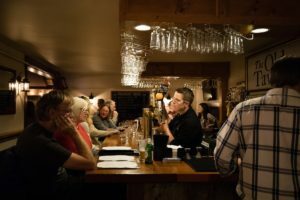 At the Grafton Inn, guests can hone their trivia talent for a gold. Every Tuesday, budding competitors put their knowledge to the test at Trivia/Game Nights in Phelps Barn. Of course, since nutrition is so important in Olympic training, come early for food and martini specials at 5:00pm and stay for trivia starting at 6:00 sharp. A $5 donation to play benefits local organizations and might just qualify you for the DINE-O Trivia Team. Also, in Vermont, at Rabbit Hill Inn, the competition is steep in Puzzle Pastime. The inn offers an extensive collection of STAVE puzzles (of course the gold medal of puzzles), and once discovered, guests quickly become experienced competitors in the completion of these puzzles because they’re so addictive. The Rabbit Hill Inn Puzzle Pastime team qualifiers take place 365 days a year in a beautiful heated facility within the Rabbit Hill Inn’s parlor. Moving to New Hampshire, at the Manor on Golden Pond, Chess becomes an Olympic sport. Located in the main living room off the lobby is a fabulous Chess set where all pieces are various sized salt and pepper shakers. Once again, here’s a sport where strategy meets endurance, as guests have been known to play for hours. Also in New Hampshire, the newest Olympic sport at the Chesterfield Inn is cat petting. 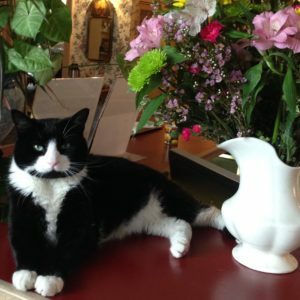 Mascot Yoda, the black and white assistant innkeeper, is a charmer and few guests get by the front desk without qualifying for this sport. The gold-metal contenders are those who own cats of their own and come equipped with a camera to take Yoda’s photo. In fact, a secondary Olympic sport at the Chesterfield Inn is Yoda Phoda Taking! In Maine, guests of the Captain Jefferds Inn can hone their Olympic Beachcombing skills. Within a short stroll from the inn are beautiful southern Maine beaches. Here’s where sand dancing, speed walking and of course swimming talent is honed. Both summer and winter DINE Olympic contenders find Captain Jefferds the ideal training facility for their sports. Head up the Maine Coast to the Camden Maine Stay Inn and here’s the headquarters for the garden strolling Olympic training facility. With extensive paths, bridges and gorgeous plantings, Olympic garden strollers find the climate and coaching here among the best in DINE country from May through October. From tip-toeing through the tulips to hopping hostas this is the perfect pedal place to practice and eventually medal in the garden strolling Olympic competition. Tune in next week for insight into the rest of the Olympic opportunities offered by the 12 Distinctive Inns of New England. You’ll be in awe of all the sports that you might qualify for. Start planning your upcoming training sessions. Before you know it, you’ll have a place competing in the DINE Olympics! This entry was posted in Camden Maine Stay, Captain Jefferds Inn, Chesterfield Inn, Distinctive Inns of New England, Maine, Rabbit Hill Inn and tagged Maine inns, New England inn olympics, New England inns, New England Olympics, New Hampshire inns, olympic training, olympics, romance is the new Olympic sport, romantic getaways to New England inns, Stave puzzles, Vermont inns by DINE Blogger. Bookmark the permalink.